​Original 'Sun' 45rpm record from 1964! Stock copy! 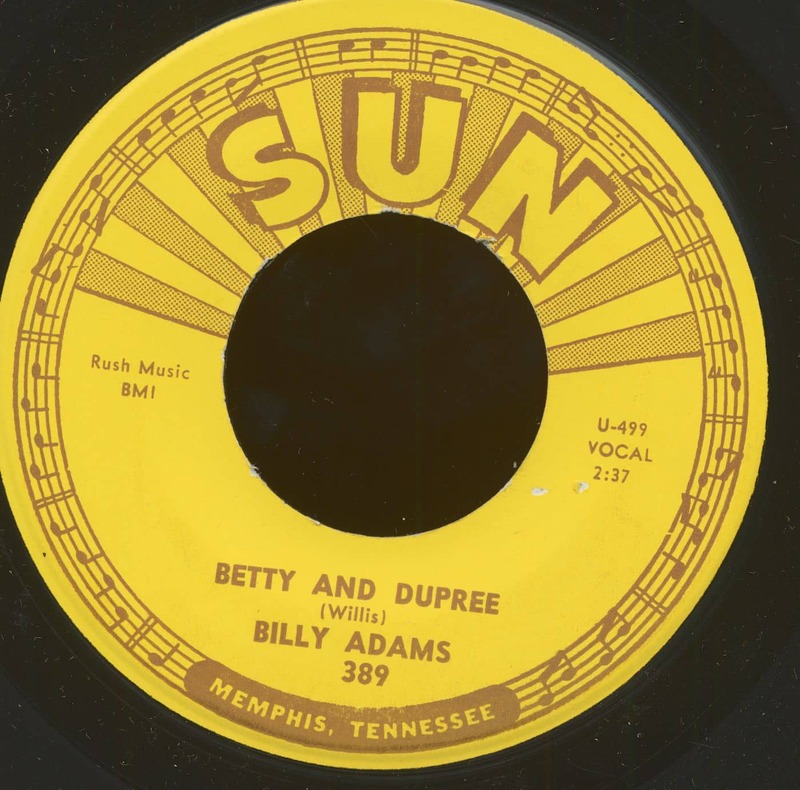 Billy Adams and his recording associate Bill Yates had more singles issued on Sun Records than many of the major names associated with the label. Because they recorded in the early 1960s rather than the rockabilly '50s their music has tended to be overshadowed by the soulful developments in black music and the blues tradition that were coming out of Hi, Stax, and other Memphis labels. Nevertheless, they were important white musicians spearheading Sun's part in the musical convergence in the city some years before the civil rights movement took hold. Adams and Yates frequently worked at the same clubs as the R&B bands of Willie Mitchell and Gene 'Bowlegs' Miller. Unlike the British beat groups who were invading white America with recycled versions of black music, Adams and Yates were part of Memphis's evolving musical scene, black and white. 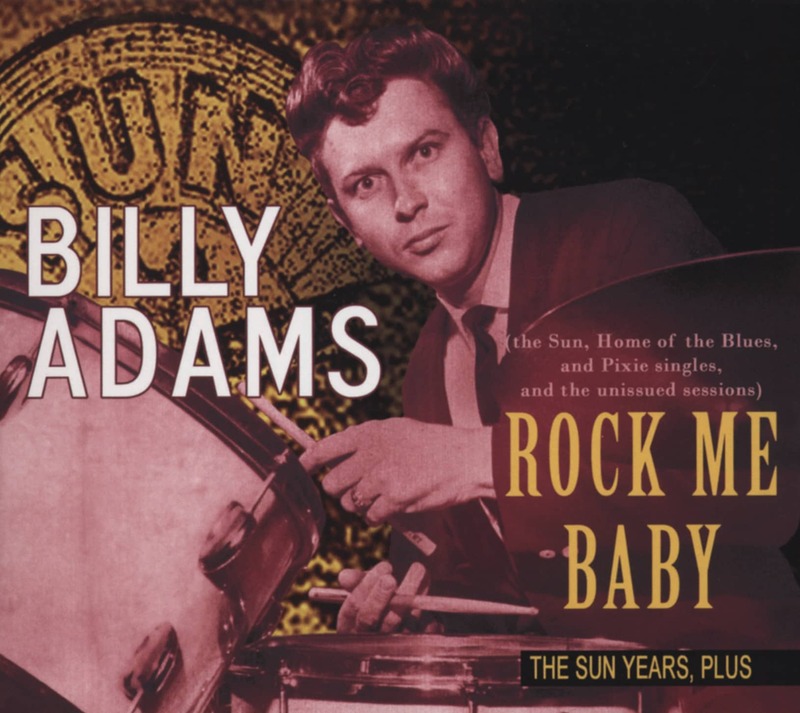 Billy Adams was the bandleader and organiser, a drummer of some note, and a decent singer. Bill Yates was less organised, a pianist of some note, and a really good singer in a range of styles. Often he played as part of Adams' band, but he would regularly disappear to follow other opportunities. 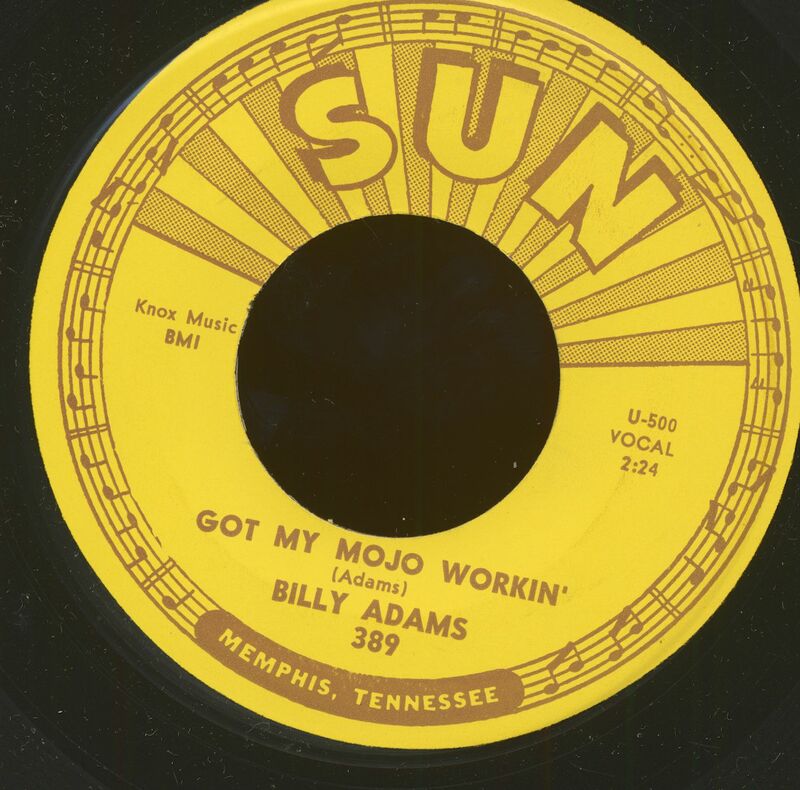 This CD collects together all the 45 rpm singles made by Billy Adams for the Sun and Home Of The Blues labels together with unissued titles and fascinating alternative versions of his songs. Here too is his rare single on the Pixie label. Apart from his four Sun singles, this music is incredibly rare and a welcome addition to the picture of Memphis music at the turn of the '60s. There is a companion CD ('Blues Like Midnight,' BCD 17277) containing Bill Yates' part in the story. Note: There are other artists named Billy Adams in the rock & roll history books, principally a guitarist from Kentucky who recorded for Quincy and Nau-Voo and who has appeared in rocking revival shows at home and abroad. But, in Memphis music, there was only ever one Billy Adams. Billy Wayne Adams was born on 9 June 1937 near Corinth, Mississippi where his family farmed and where Billy would probably have farmed too if an interest in music hadn't taken him away from ploughing with mules and fishing in the lakes. His father was Robert Chester Adams (1909-82) and his mother Anna Leona Essary Adams (1909-88). Billy had taken an early interest in music but he was around 16 years old when he started to study music seriously and to play the mandolin in little local country groups. He later told Jane Sanderson from the Memphis Press-Scimitar that he picked up music just by playing, adding, "Oh, I had a few lessons from time to time, but they didn't amount to much." 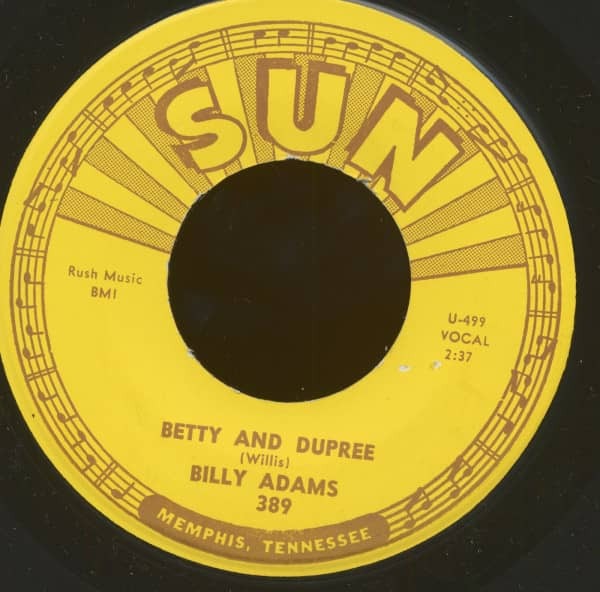 Nevertheless, they amounted to enough for Billy's music to offend his father who wanted help on the farm, and in 1953 Adams left home to settle in Memphis with relatives. Memphis guitarist Ronald Smith said, "I first knew of Billy Adams when we were both at South Side High School and he lived near me in the Whitehaven neighbourhood. He was a tall ... guy, real likeable. He was a little older and he played drums in the High School band." Before long, Adams was out of school andworking for $37.50 in an auto parts store. The 1956 City Directory lists him as a mechanic at Pure's Automotive at 383 Monroe Avenue, and living at 1041 Philadelphia Street just north of Whitehaven. He had been playing with hillbilly musicians whenever he could, featuring on mandolin in a band called the Rhythm Playboys: "I played that kind of music until 1955 and then I started playing drums when rock & roll came out" he told Sanderson. Memphis guitarist and producer Roland Janes remembered Adams from that time: "Billy was a long, lanky guy. When I first met him he was playing mandolin and singing and he started doing an Elvis Presley-type act. Then he started playing the drums. I used to see him at 'Doc' McQueen's house. That was J. P. McQueen who worked as a banker, but he wanted to be a songwriter and a musician and he had tape recorders in his house where musicians would all go to jam and try out things." McQueen had a swing band at Charles Foren's Hide-A-Way Club in Memphis and also tried forming a small rock 'n' roll group at one point. Billy Adams got himself involved in all these ventures and then started gigging with other groups. For a time he played with Charlie Feathers, and between 1958 and 1960 Adams worked off and on as a touring road drummer with Johnny Cash, Carl Perkins, Jerry Lee Lewis and Patsy Cline. In particular, he worked in Las Vegas with Carl Perkins, an experience that would stand him in good stead when he developed his own showband in Memphis clubs. Customer evaluation for "Betty And Dupree b-w Got My Mojo Workin' (45rpm, 7inch)"